When you think of squatting, what exercises come to mind? The unilateral variations deserves it’s own section later on, so bear with me. What I mean by “Squat with balance” is to assess whether you need more squatting or not. This comes back to understanding your “why”. If you squat every single day without any regard for how often you are hinging throughout the week — you’re bound to develop structural imbalances. For example, if your Deadlift and Sumo Deadlift are not around 110% of your Back Squat, then that may be an area of focus for you before you decide to keep driving up your Back Squat. This is a little different if you’re a powerlifter. If your Front Squat is not 90% of your 1RM Back Back Squat, then you may want to emphasize more loading in the front rack before resorting to the Back Squat. These ratios are not set in stone. You have some wiggle room with these, but it’s to give you a ballpark idea of where you might be at. 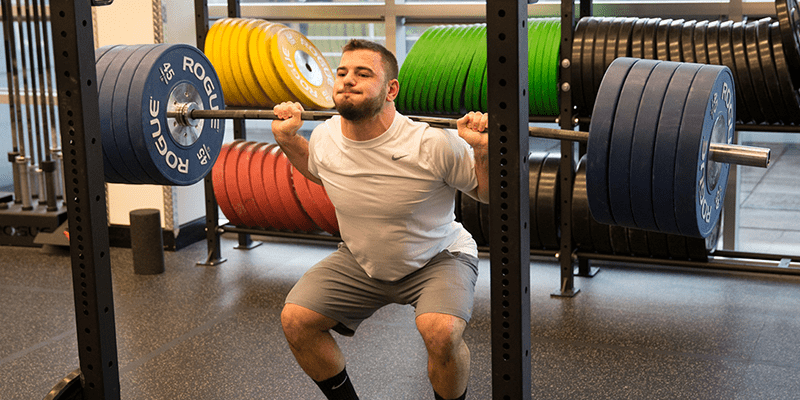 Ask yourself why you’re looking to improve your squat? Is it mobility? Is it strength? What for? Regardless of your answer, this is something you’re going to want to keep tabs on as you progress.